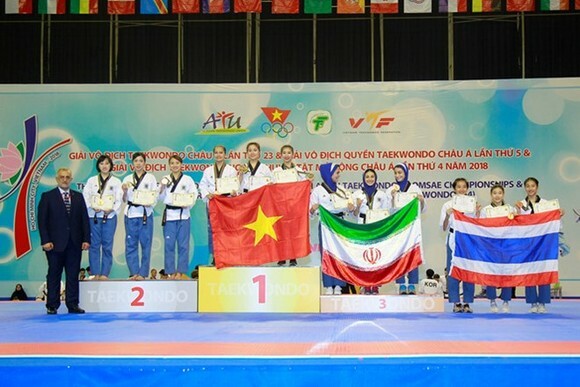 Vietnam finished third at the fifth Asian Taekwondo Poomsae Championship, which closed in Ho Chi Minh City on May 28. 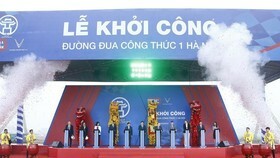 Vietnamese athletes won two gold medals, four silvers and three bronzes during the tournament. 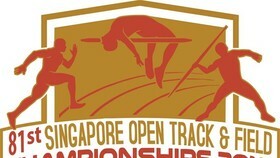 The Republic of Korea (RoK) ranked first, with ten gold medals and three silvers. The runner-up was Iran with four gold medals, two silvers and five bronzes. The same day, the 23rd Asian Taekwondo Championship also closed in the city, with top spot held by the RoK, with seven gold medals, two silvers and eight bronzes. Next was China with four gold medals, two silvers and two bronzes and Uzbekistan with two gold medals, one silver and five bronzes. 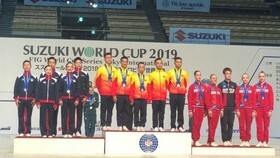 Vietnam won one gold, the first for the country at the continental event after six years, and one silver and one bronze, ranking sixth overall. The 23rd Asian Taekwondo Championship was held by the HCM City Department of Culture and Sports and the Vietnam Taekwondo Federation from May 24-28, attracting nearly 700 athletes from 50 countries and territories. Truong Ngoc De, Chairman of the Vietnam Taekwondo Federation said the event offered a chance for Vietnamese athletes to learn from their rivals before the 18th Asian Games in Indonesia in August.